As you can see home prices are still growing year-over-year at a pretty substantial clip. The rapid growth acceleration in late 2010 that went to growth levels above 10% are gone, but we are still seeing growth of around 5%. 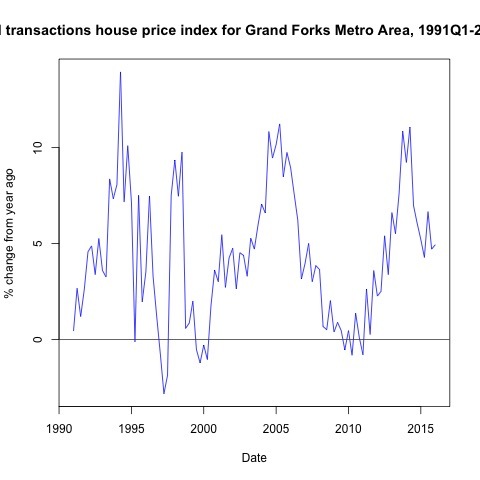 It is important to note there are actually few instances of year-over-year price level declines in the past 25 years. The big one was obviously the 1996-97 timeframe when there was an Air Force base restructure and the flood. Looking at the picture it might be the case that we are on the downside of another growth cycle. That is an easy picture to draw, especially given the 2000-10 portion of the picture. I think that is a hasty conclusion at this point though. Certainly we are off peak growth levels, but think about the larger context. The interest rate environment right now is supporting home purchases and incomes are starting to grow. The fact that population in Grand Forks really is not seeing sustained growth in key age sectors is one of the few negatives for this environment.